Having established a successful business in South Africa, David Turner decided it was time for his family to visit their ancestral home and with his wife and five children they boarded the ill-fated passenger liner, the Waratah, bound for London. The Waratah was on the return leg of its maiden voyage which took it from England to Australia where it called on Adelaide, Melbourne and Sydney before sailing to South Africa. On the evening of 26 July 1909 the newly built ship left Durban and was expected to reach Cape Town on July 29 but it never arrived. A search was mounted but no trace of the ship nor its 211 passengers and crew was ever found. The disappearance of the Waratah remains one of the mysteries of South Africa’s maritime history. There were reported sightings of the Waratah making its way along the Transkei’s aptly named Wild Coast, and there were also reports of bad weather and rolling waves at the time if the ship’s disappearance. John Cochrane-Murray, David Turner’s business partner took over the running of the business deciding to keep the Turner name as a mark of respect for the friend he had lost. The Company has remained in the family to the current day. 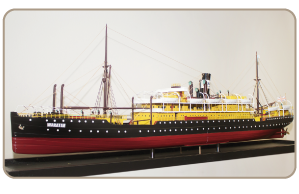 Models of the ill-fated Waratah have pride of place in the offices of Turners Shipping in Durban, Johannesburg and Cape Town. They were commissioned by the current Group CEO Conrad Cochrane Murray as a reminder of the company’s origins.